This photo, where a couple of the games were setup, was taken early on before the hordes arrived. 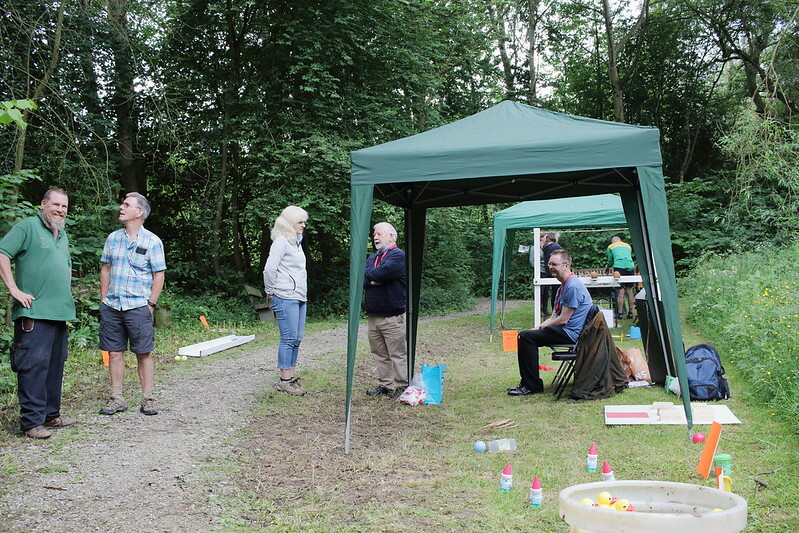 The Reserve Warden, Steve, is on the left. 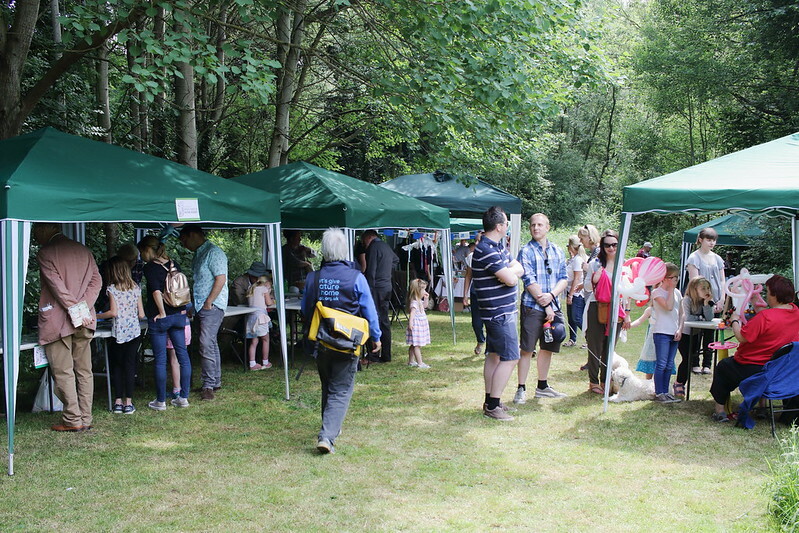 In addition to the games there were also stalls for numerous organisations- Baildon in Bloom, Friends of Denso Marston Nature Reserve, RSPB. The long grass on the right of the photo is where Steve mows the grass in a particular shape. You can see the shape of a Dragonfly in the grass cutting on Google satellite view. Behind me when I took this photo was a demonstration of bird ringing. 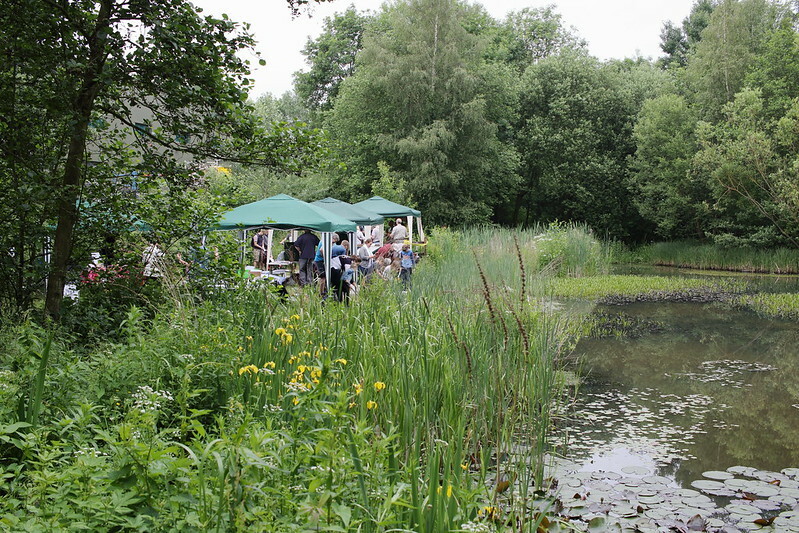 Over by the pond were Baildon Ukulele Group, Fiona from Bradford Rights of Way, Richard Perham from Bradford Countryside Service, Yorkshire Dragonfly Group and people helping identify the creatures from the pond dipping. 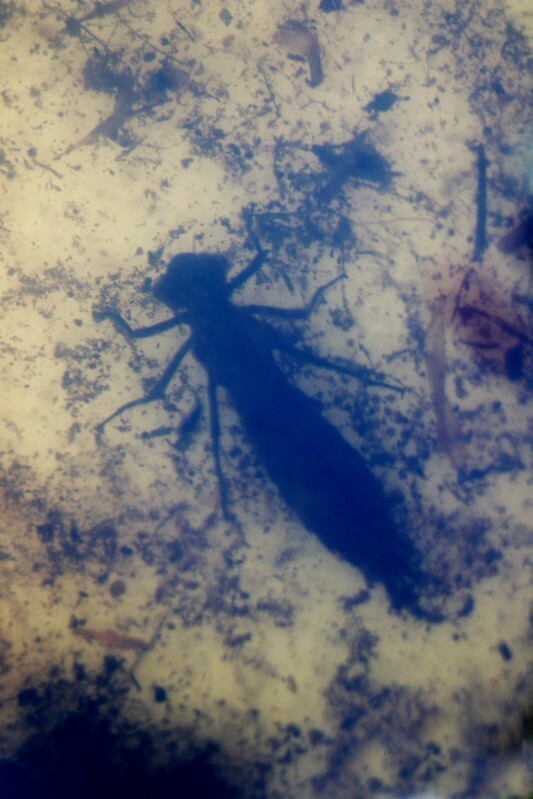 In addition to the small trays for the people doing the pond dipping there was also a big drum/tank for some of the specimens like this Dragonfly. 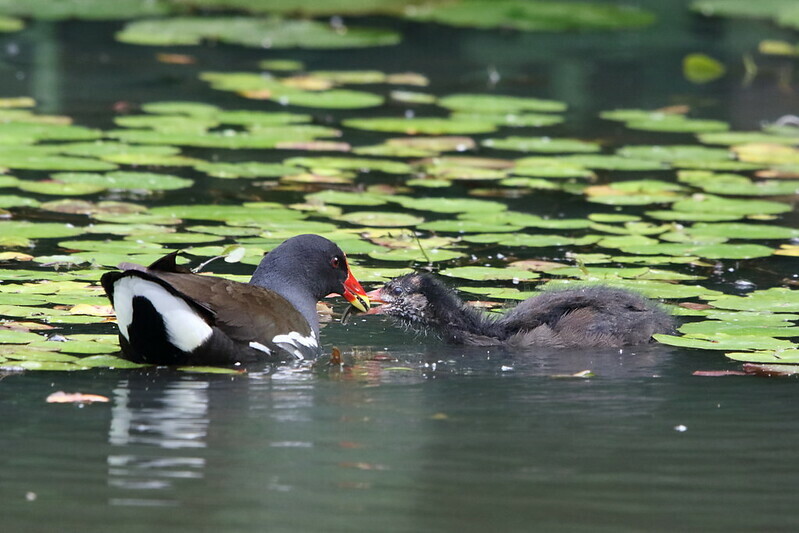 A few times Moorhen showed themselves on the pond seeming to ignore the people. 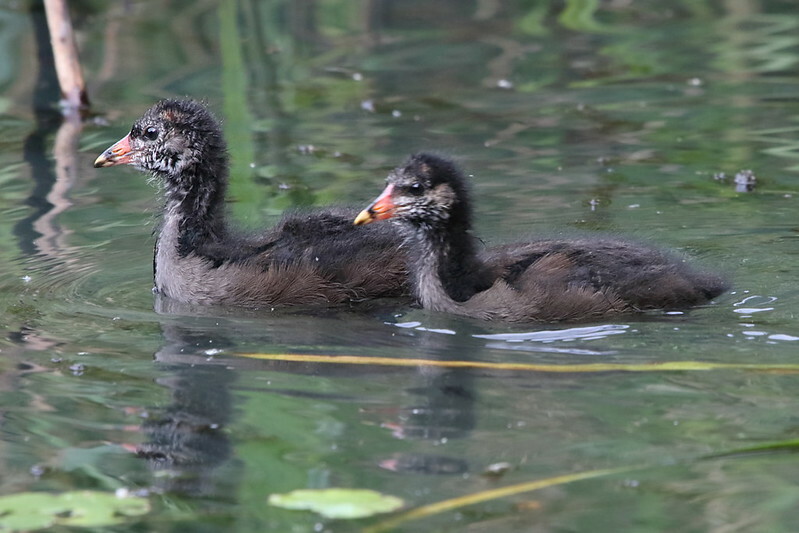 This is thought to be two chicks from an earlier brood and one chick that hatched more recently with one of its parents. This is the two older ones. 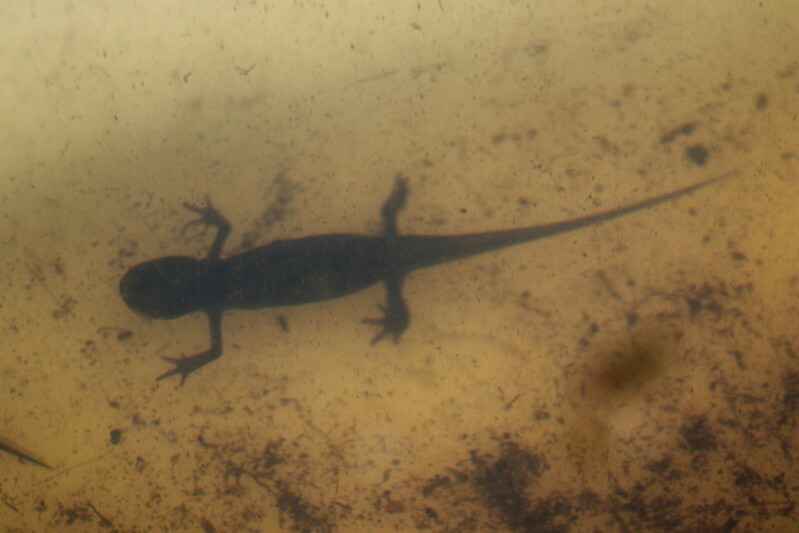 And here the newer one is being fed a tadpole by the adult. 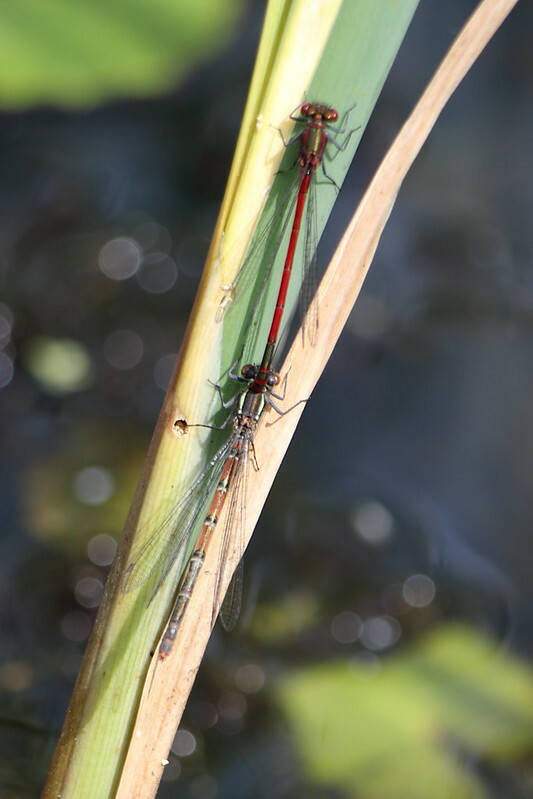 It’s a nature reserve so a couple of times I went looking for wildlife. 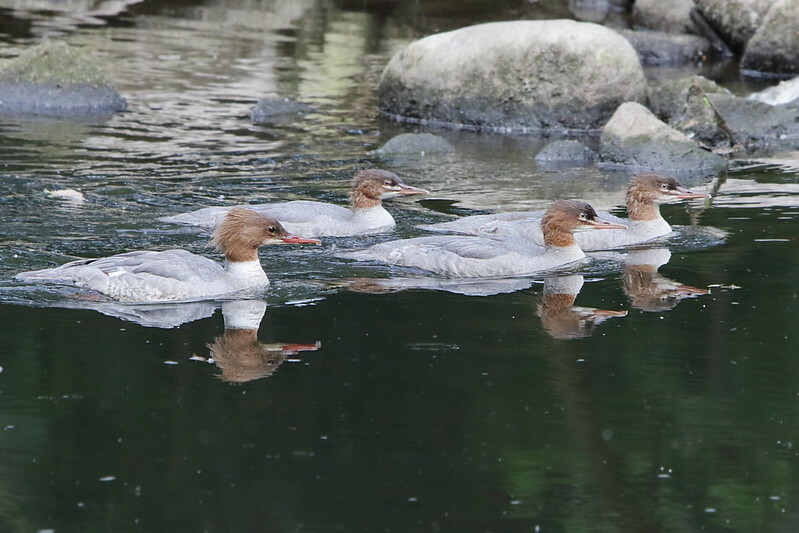 Here’s a female Goosander with 3 juveniles. 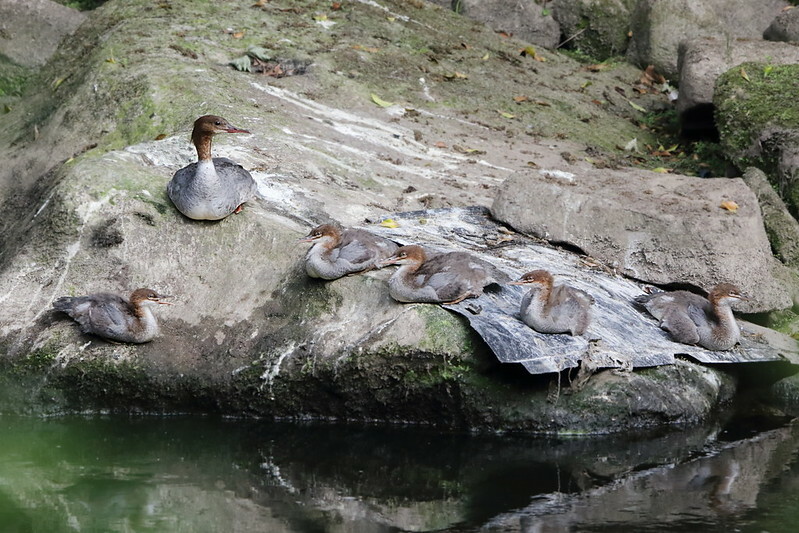 Later on I saw this family out of the river on rocks. 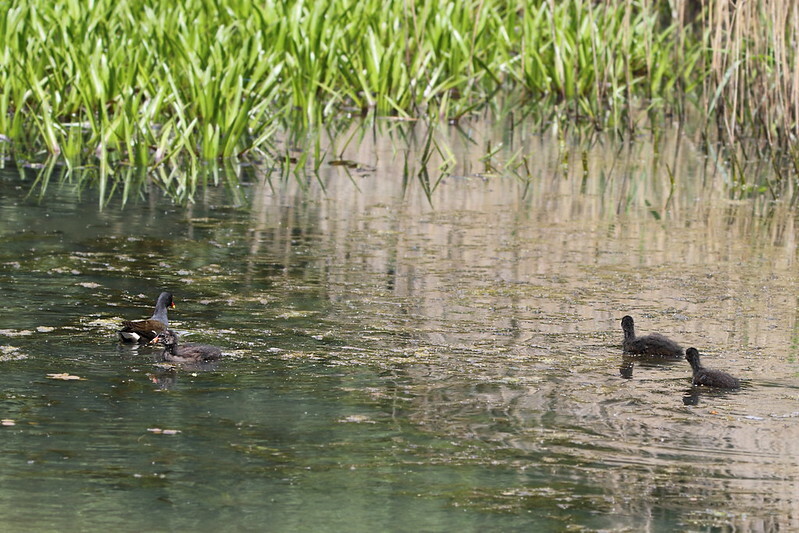 Also later on I saw a larger family, in this case seven juveniles. Two are not in this shot they are further over on rocks to the right. Note that most of them are on a large sheet of plastic. 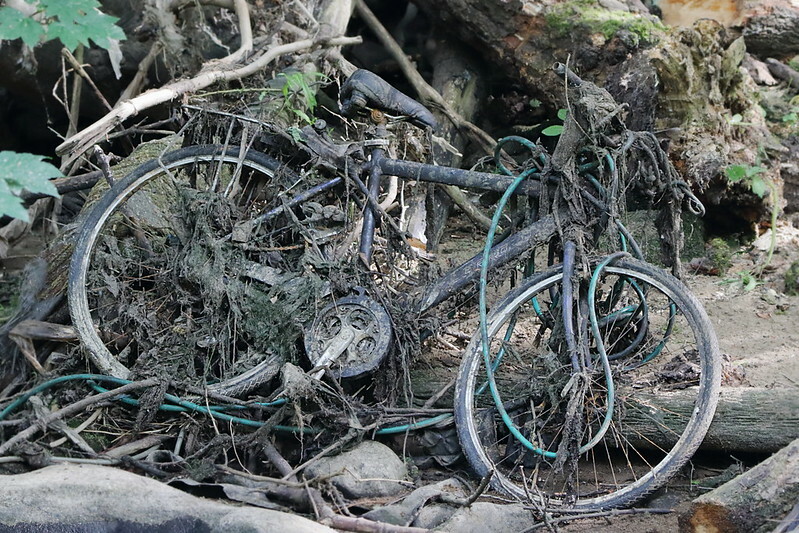 There is a lot of rubbish in the river and on its banks including shopping trolleys, trailers, rope, cable, pipes and, as shown above, bikes. 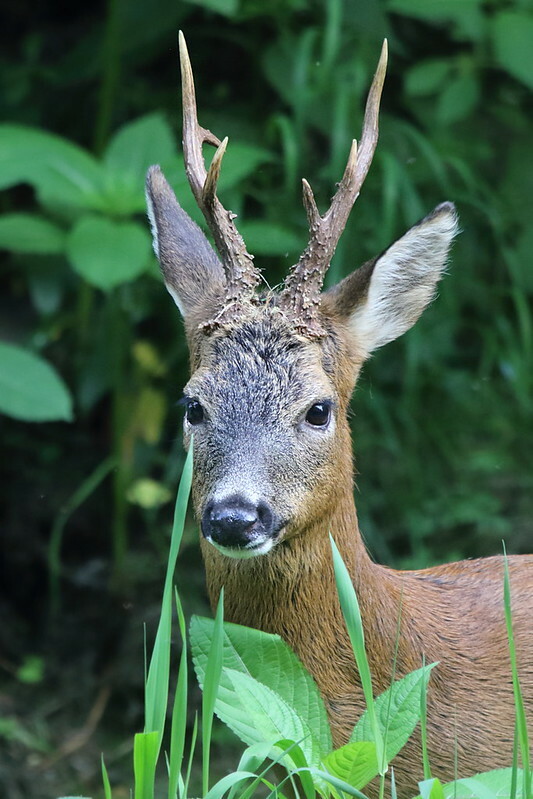 This male didn’t seem too worried by me taking its photo. 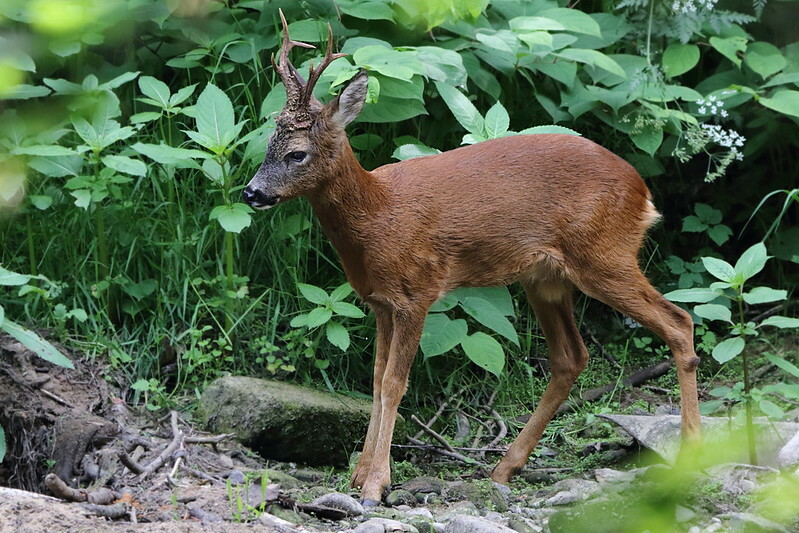 It strolled along the river bank eating various plants as it was going. 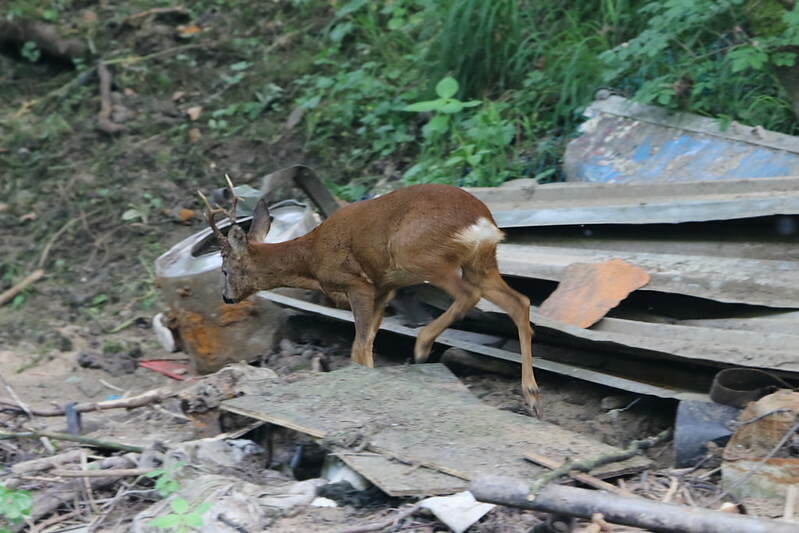 It then picked its way through sheets of plywood, sheet metal, drain pipes, washing machine drums and then climbed the bank and disappeared. 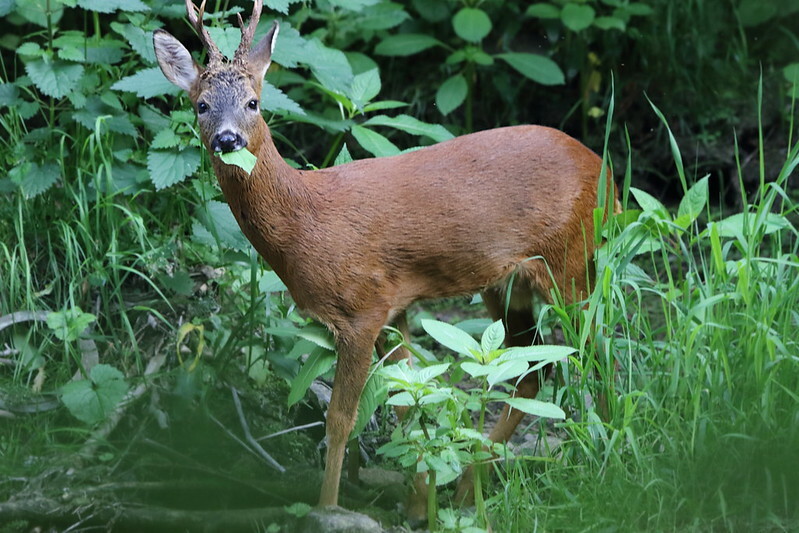 In amongst the vegetation is where you might expect to see Roe Deer – not stepping through all the rubbish left around by us. Back at the pond I kept my eye on what looked very much like a submerged branch but I noticed that it was very slowly getting closer to some of the plants. 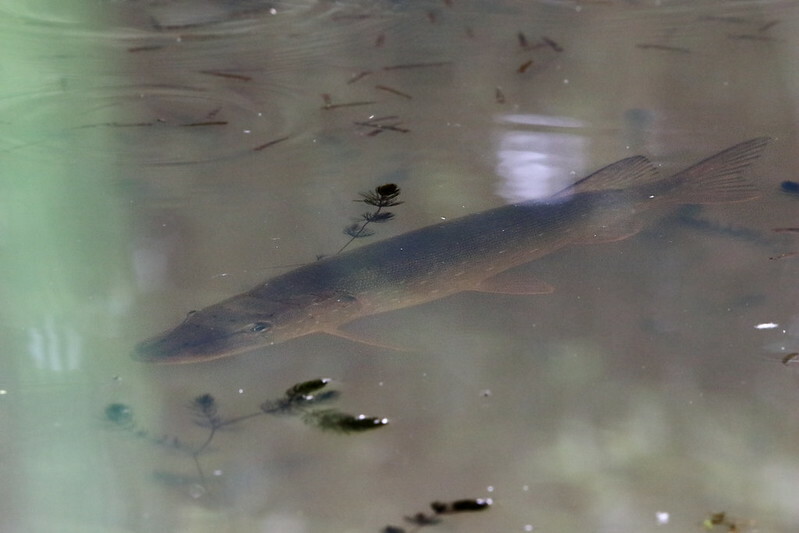 Using my camera and focusing beyond the surface of the water showed that it was a Pike. 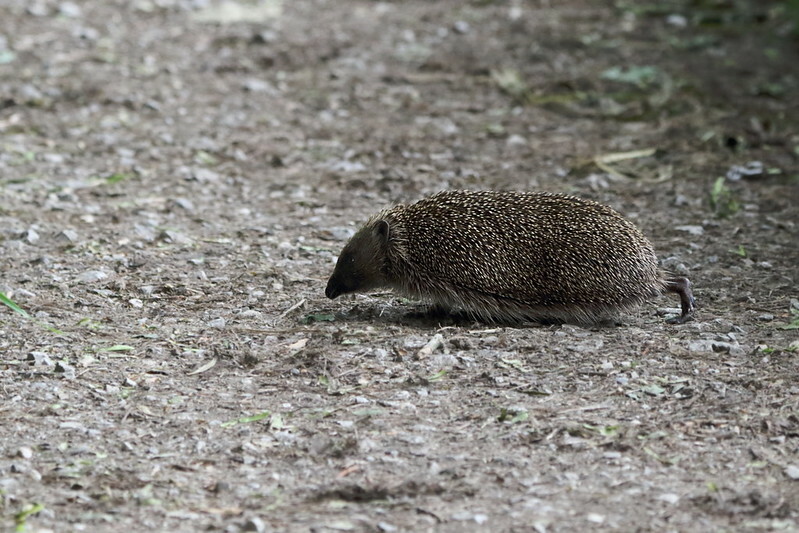 Heading back along the river to the entrance to the reserve I spotted this Hedgehog snuffling across the path to disappear in the hedges. As usual the photos are on Flickr so you can click on any of them to view them within the album that has several other photos from the day within it. 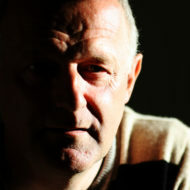 These are wonderful photographs Paul. Thank you for sharing.